I could say good things about this place all day. The employees at the front desk are incredibly helpful, they welcomed us in right away and were awesome all week long. There is free coffee right when you walk in because lets face it - driving is tiring. The bathrooms are very clean, we have been here for 9 days and I believe it's cleaned fresh every morning. The showers have super hot water and good pressure. Each morning before 11am there is a valet trash pick-up, we thought that was awesome. Very pet friendly and close to an awesome dog park. Best of all, it's pretty close to the downtown area. We would definitely stay here again and recommend it to anyone. We stayed here for four days while visiting the Nashville area. The office staff are very professional, knowledgeable, and pleasant. The office store is well stocked and reasonably priced. The sites are open and easy to access, the shuttle to the downtown area is very reasonable and the drivers were excellent. I would definitely stay here again in the future! Stayed here for 5 nights at the end of a month long road trip heading home. The wifi was terrible, nearly non existent , I was able to hack into a neighboring RV park to use their's. The sites are really close, so if you travel with a dog be aware of this. On the plus side it is very close to the grand ole opry and other attractions including the outlets and restaurants. Labor day weekend and my husband, mother and I were excited to spend it in Nashville. Very welcoming entry and check in. Excellent shuttle service companies can pick up there. But that was the best part of our stay, unfortunately. Very few 50 amp sites, so positioning allowed for a lot of sun. Lots of dogs but no place for them to run. Patio pads in desperate need of repair. Baths were clean mid morning (and inconvenient when cleaning during the busy times,) but by the evenings the soap dispensers were broken off the wall (womens), feces all over the toilets (mens), not sure if vandalism or just drunk people. Our neighbor had the only barking dog...at everything. His owners were drinking a lot with foul language, not caring about the dog's nuisances. We were given meal tickets to their pizza party but everything was gone within the first hour and there were a lot of non-campers there for the free food, drinks and music. There was a pool. We kept overlooking our inconsiderate neighbors, but the straw that broke our back was when were gearing up to check out which is 11 a.m.and a man began mowing at about 10 a.m. Not just around sites that were empty, but right in between our two RVs!! Our other neighbors had to hurry and bring in their drying clothes, and grass flying everywhere along with the noise. Mowing should be after check out and never in between units that close. It was the most we ever paid at a campground, but it's Nashville and there are more expensive campgrounds there. Very few campers spoke, it was just a very disappointing experience. We won't return. We are in our 50s and 60s, maybe we expected too much? We had a wonderful stay! The staff was terrific from the moment we arrived. Always helpful and informative. Facility was fantastic, easy to navigate, and had all of the needed amenities. We used this park as a staging area for our visits to downtown Nashvile. The shuttle made it easy to head downtown and there are even some spots within a short drive from the park. Would absolutely come back for another visit! Location, Location, Location is the reason for the 4 stars. Basic facility. Close quarters, only 2 pull throughs. Site not very level. Left front wheel was off the ground. Very friendly staff. Would stay again but next time will try to find park will more space. There are two next door. Wonderful campground. The staff was awesome. Great knowledge of the area. The shuttle service was great! Good space between sites, nice and level. clean and very well maintained. on the list to go back to for sure. Absolutely recommend. Nice campground we have stayed here several times. Once was for several days to visit Nashville other was an over night stop on our way to FL. Park is clean, easy to get to off of the highway. Staff is friendly and helpful. Did not use the restrooms. This place was ok until it got really cold. Were not allowed to use water or sewer hookup - understand why BUT no one notified us. Just happened to see a sign on the store door. Fine was $250 if anything happened to their system - but cannot believe they didn't have the decency to come around and inform people. Because of the water issue we had to use camp bathrooms which were so small. If there was a bigger one for handicapped we never found it. Sooo disappointed in the shower/restrooms - stalls so narrow couldn't even put arms out in shower - tiny area to dress. Overheated, too. Location was good and the Santa Fe Cattle Company restaurant has the best ribs we ever had - went there 3 times in 7 days. Great location for visiting Grand Ole Opry, Opryland and The Hermitage,From Briley Parkway you have to negotiage about 1 1/2 miles through a very busy congested area. There is a camping world on one side, and an indepent dealer on the other so, if you need any supplies or repairs, you couldn't find a better location. There is also a KOA and Jellystone park in the same 1 mile stretch. So if they are full there are other options real close. Wifi had Good Connection, Limiting all sites to 3 down/1 up which is good enough to stream in SD, no data cap. In my testing I got close to those speeds. Connection speed is a limited resource, I would much rather see it limited than wide open, and one person, sucking up all the bandwidth. Gravel Site with concrete patio with picnic table, Fairly Level, Free Basic Cable. Site size is average. There are only a few pull through sites, many of the sites are only 30 amp, and some do not have full hookups. It was dark when we pulled in and the site # were not easy to see. Park is Clean, well maintained, I there are any long term campers they were not obvious. Staff was Friendly and Helpful. My Tmobile Router had great signal without using external antenna (35 down/24 up) ATT excellent (58 down/6 Up). $47 with Good Sam discount a bit steep for 30 amp backend. Stayed here in November in our 40' Class A motorhome. Had a back in gravel site with full hookups. Site was ok but a little muddy. We were close to wash room which was clean but could use updating. Not a lot of places for dog walking away from campsites and other campers were not good about picking up after pets but you find that in most places you go. Very busy area with lots of restaurants and RV stores available. We bought propane on our way out from the RV store next door and they were very helpful. Would definitely stay here again. Owners are very friendly and helpful. The restrooms are spotless at all times and the staff are very helpful and friendly. This park is conveniently located for many of the attractions around Nashville. The sites are quite tight and often had no defining line between one space and the next. The staff is great and there is a Camping World store right next door. The cable TV is marginal on signal clarity and the WiFi bandwidth is also marginal. Not a bad campground but nothing outstanding. Just a good average park. Located in the Music Valley Drive area of Nashville, it is near The Grand Ole Opry, Gaylord Opryland Hotel and the Opry Mills Mall. 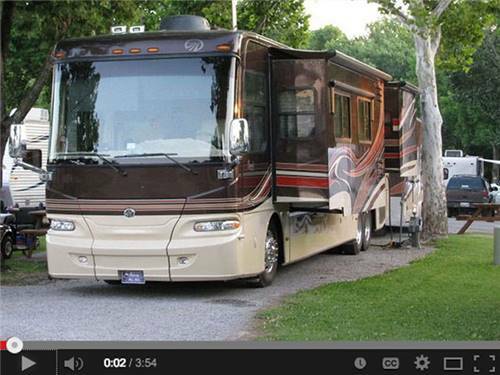 Located between two RV service centers which is very convenient if you need service. Friendly staff, store, pool and live entertainment. The laundry room was air conditioned and the units were very good. Sites very close, garbage pick up at site, good hook up connections, most cable channels were good, as expected the wifi is slow at times Shuttle to Broadway in Nashville is very convenient ($10). This campground is nice. Back in spaces were all I saw. Spaces are big enough and the roads are wide enough to back in easy. Cable tv was ok. Internet isn't very good as they limit your usage. It was covenant to the grand Ol Opry is just down the street from here. 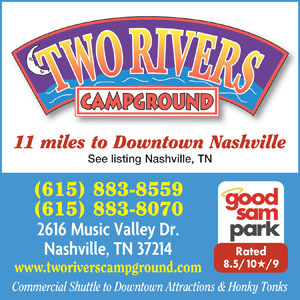 +++ Nashville is also close to this campground. I would stay here again if visiting Nashville. The restrooms were very basic and not to the standard of other RV parks I have stayed. We could not get wifi at the pitch and had to go to the main office any time we wanted wifi. The pool was not open and there was no entertainment available. A very disappointing site and not one I would recommend to anyone. We stayed 3 nights. I agree with all the other reviewers' experiences. It was really not the ideal time of year to visit Nashville, but we had a great visit. It snowed and temps were freezing. Location of this campground is excellent and we enjoyed the Country Music Hall of Fame, Centennial Park, and went to the Opry/Ryman. Will likely return in warmer weather and stay longer. Excellent greeting at reception, gave us all kinds of information for touring Nashville. Lot was nice. Love the central location. Price was very reasonable considering we always went next door to KOA. Shuttle for $10.00 round trip is great. Will return next time in Nashville. A nice park with full hookups that work well including cable and WiFi. Paved roads and gravel pads are a little closely spaced but roomy enough for easy parking for even the biggest rigs. Office crew are friendly and full of information about the area and they can provide show tickets and shuttle into town if wanted. Decent little store, nice pool, nice clean bathroom/shower facilities and laundry is available. I was surprised at how quiet the park is considering how close the highway is but didn't hear any traffic noise at night. Need RV supplies? There are two large dealers on either side of the park including Camping World. Get gas just after leaving the highway and turning toward the park; it’s the only one by the park. Quite full when we were here so I think reservations are a good idea. $50 with gs. Try the CockO'the Walk restaurant for great steaks and fried catfish and an easy walk from the park. Stayed here for a week while touring Nashville. Everything was top notch. Everything was clean and functional and had the best cable signal I have ever had in a park. There was free outdoor music (mostly country of course) ever night and the staff was great. 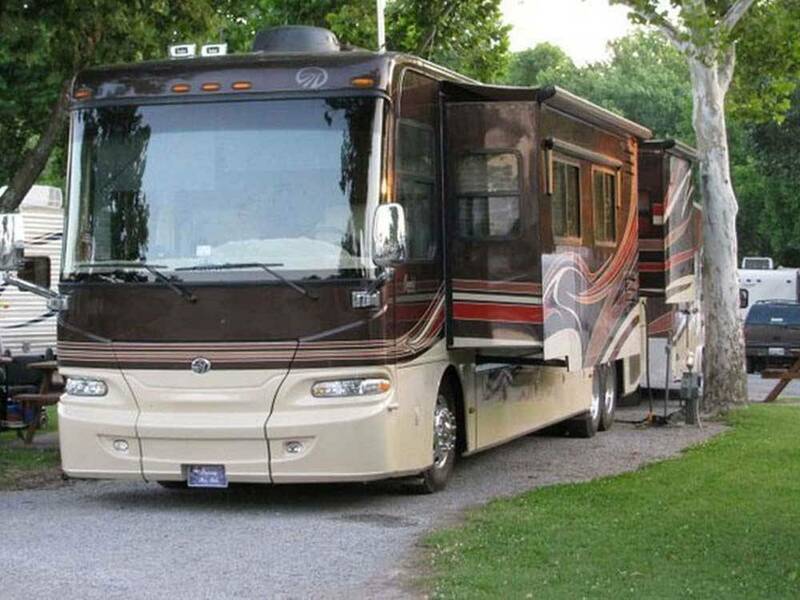 The only downside is the lots are a little tight so your view from your camper is mostly of your neighbors, but each sight is very well maintained so what you do have is very nice and comfortable. Dog area was also a HUGE plus for us. There is some very small highway noise but it very minor. Would gladly stay again next time in Nashville. Also consider taking Tommys Tours available at the main office. Nice peaceful park with nice pool and live music in evenings. Situated between Jellystone Park and KOA, so there were few children at Two Rivers (hence peaceful). Good price considering it is on Music Valley Drive. Shuttle bus service to downtown Nashville. Easy access to Opry Mills and don't miss walking through Opryland Hotel! Only down side was campground office / store has a very musty moldy smell. Would stay here again next time we're in Nashville. We checked in and were greeted with a friendly staff. They were very informative and made the check in process simple. The location is convenient to downtown; the facility has a lot to offer. Nice pool, Great onsite store with everything from food, tools & souvenirs. Sights were easy to pull into and hook up. WIFI was intermittent. There is a Camping World on one side and a RV service center on the other. If you need any parts or supplies try the Cullum & Maxey Camping Center. I would highly recommend this to anyone thinking about stopping. This campground was comfortable a good stop over. Nice shade trees. Gravel spots. A little tight and close to neighbors BUT the staff were great and helped me out of a big problem. They shipped a small package for me and supplied the mailing envelope free. Delightful help! And Sunday live entertainment was fun too. Thanks! I think the park is overrated and expensive for what there was. The interior roads were terrible. The road in front of our RV started out as a pond and after some rain became a lake. The sites were pretty close together. Will have to say the restrooms were very clean and personnel were friendly. Definitely will not stay here again. Pleasant staff in a great location. Site was a backin with patio and table surrounded by grass. Restrooms were very clean, by stalls a little tight. Stayed for 3 nights. Enjoyed the live entertainment one night. Took shuttle to Grand Ole Opry for $5 each round-trip. Also shuttle to downtown ($10) dropped off just a block from the Ryman Auditorium. Don't miss Andrew Jackson's Hermitage an easy 20 minute drive from Two Rivers. First time we've stayed here. Good location next to Camping World and two other RV sales firms. Close to busy highway but almost no road noise. Cable is very basic and not all channels listed in guide are actually available. Bathrooms were spotless. Showers were tight but everything in this area super clean. Interior roads just like Nashville's - lots of potholes. Nice store and very helpful staff. Daily garbage pickup. Clean campground. Nice pull through sites with full hookups. Nice store and hosts were friendly. Close to so much with shuttles that can take you downtown. We will stay here again. Nice enough, we are staying 3 nights. Really small & tight sites. Our RV is only 20 ft & it barely fit in our space & I could almost shake hands with my neighbors (Not private). Internet while included is weak. Cable seems okay & includes my favorite channels. It has a nice outdoor pool, is next door to Camping World and the $10 RT shuttle to town gives it higher points. Stayed here for 2 days on the way through town so I could see my daughter after she got off work a few days. It was very convenience to tons of stuff for the wife and kids to go do. But it was also quiet enough that I enjoyed just kicking back at the camp ground and relaxing while they were gone. Very clean and well kept up. Right next to camping world too which is where I spend part of my time. This RV park was great. The owners and staff were wonderful. Pork, the country singer was great. If you don't have a vehicle and don't mind walking, the Opryland Hotel is 1 1/2 miles away. Friendly staff, store, pool and live entertainment, Located in the Music Valley Drive area of Nashville, it is near The Grand Ole Opry, Gaylord Opryland Hotel and the Opry Mills Mall. Shuttle to Broadway in Nashville is very convenient ($10). It's ok,, showers and wash room in the center of the park are small, the one s at the main building are a good size. Wi Fi is not consistent on , off . Cable the same. The good thing is the shuttle to downtown for 10 bucks . Overall it's ok.